The Kids Windmill Road Jacket from Jack Wolfskin makes blustery autumn weather much more fun. 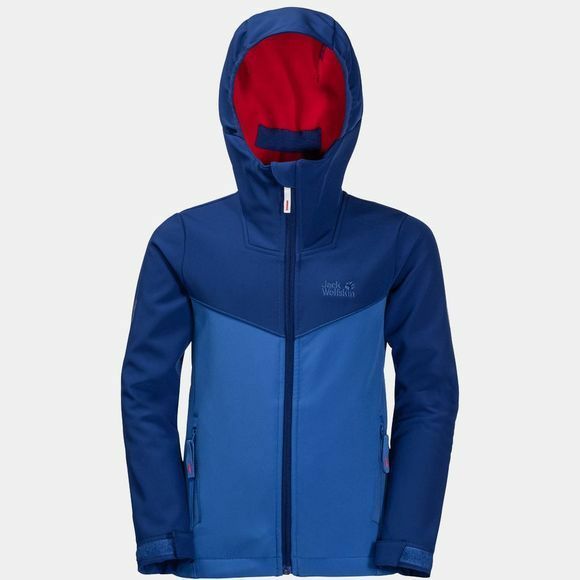 This sporty hooded softshell jacket is fully windproof and has a water resistant finish that simply shrugs off short showers.The stretchy Stormlock fabric ensures good freedom of movement and is robust enough to withstand all kinds of adventures. The fabric is also very breathable, so the Windmill Road will always feel great whatever your little explorers get up to. With its soft fleece Lining and snug hood, this jacket is nice and comfortable, even when the weather isn't.The draw cord tabs to adjust the hem are hidden safely inside the jacket pockets to prevent them getting snagged.